German playwright and physician of the fifteenth century; said to have been bornin Worms. He is mentioned as "Hans Falz zu Nurmberk balbirer." 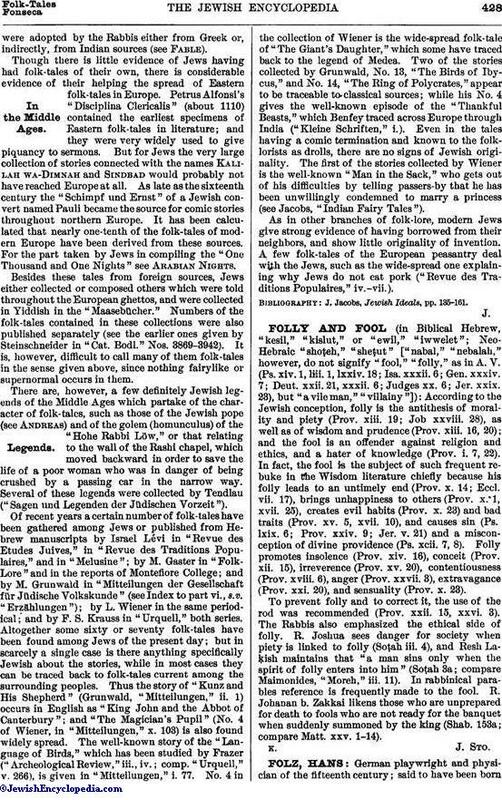 Folz wrote numerous farces and "Fastnachtspiele" (Shrove Tuesday dramas), and introduced here and there Jewish characters, generally for comic purposes. The parts they play are usually ridiculous and contemptible. In his "Die Alt und die Neu Ee," where the religion of the Talmudim and Midrashim is contrasted with Christianity, to the latter's advantage, Folz has certain of his characters sing a corrupted version of the "Adon 'Olam," which the rabbi of the play then interprets. This fifteenth-century version is the oldest German translation of the prayer in rime. 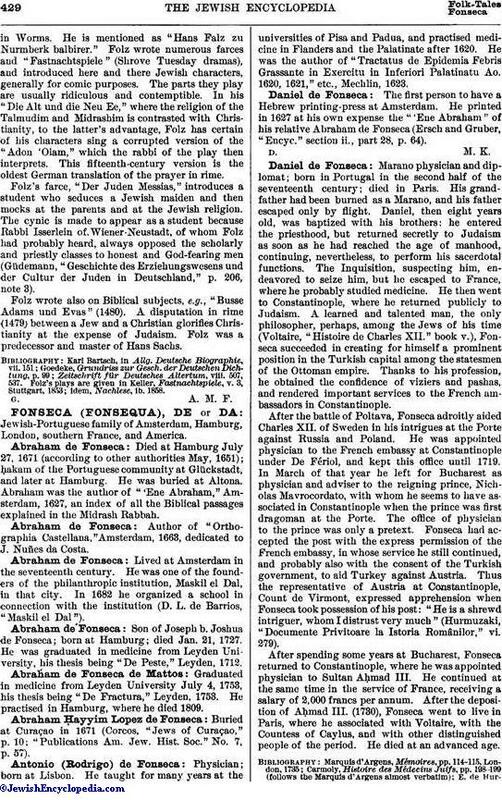 Folz's farce, "Der Juden Messias," introduces a student who seduces a Jewish maiden and then mocks at the parents and at the Jewish religion. The cynic is made to appear as a student because Rabbi Isserlein of Wiener-Neustadt, of whom Folz had probably heard, always opposed the scholarly and priestly classes to honest and God-fearing men (Güdemann, "Geschichte des Erziehungswesens und der Cultur der Juden in Deutschland," p. 206, note 3). Folz wrote also on Biblical subjects, e.g., "Busse Adams und Evas" (1480). A disputation in rime (1479) between a Jew and a Christian glorifies Christianity at the expense of Judaism. Folz was a predecessor and master of Hans Sachs. Zeitschrift für Deutsches Altertum, viii. 507, 537.